On a global scale, which product is produced the most in weight per year – steel, cement, plastic or paper? 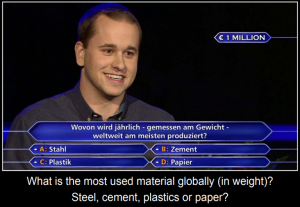 Would you have known the answer to this 1-million-euro question in a popular German TV-Show? While the candidate was not sure and left the show with “only” half a million, we can tell you know: It’s cement! Together with LafargeHolcim, the largest cement producer worldwide, the ifu Hamburg team visualized energy flows for the cement production in Lägerdorf, Northern Germany. The results were presented by Werner Carstensen, category manager at Holcim Deutschland, at the Ressourceneffizienz-Treff (Resource Efficiency Meeting) 2018 in Hamburg. At this event organized by ifu Hamburg, more than 80 participants from industry, consulting and research discussed energy and resource efficiency. Cement significantly shapes the world we live in, connecting us via bridges, highways and ports, and providing space to live and work in, from tiny individual homes to enormous skyscrapers! 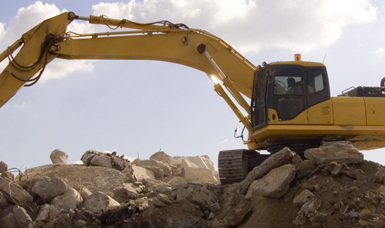 It is a binder which, when mixed with water and other components, can be used as mortar or concrete. Cement is based on chalkstone and clay, as well as sand and surrogate materials such as flue ash. 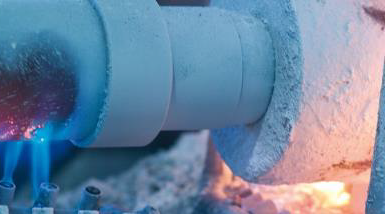 Its production chain starts in a chalkstone quarry and leads into a furnace, in which the components are burned at high temperatures over 1000°C to obtain cement clinker. To generate these high temperatures in the furnace, large amounts of fuels are needed, leading to high CO2 emissions. LafargeHolcim is the globally leading producer of cement, with a focus on sustainability. One of their production sites is located in Lägerdorf in Northern Germany, providing 1,3 million tons of cement clinker per year. In this process, the factory emits more than 1 million tons of CO2 per year, of which 2/3 are process-based and only 1/3 are energy-based and thus influenceable. The ifu Hamburg team supported LafargeHolcim in the creation of material and energy flow models visualized as Sankey diagrams for the Lägerdorf production site. The Umberto software allows to analyze and illustrate volume flows within a production system, immediately drawing attention to the most important flows by the size of the respective arrows. Werner Carstensen, procurator and category manager at Holcim Germany GmbH, said: “We have seen that, regarding energy flows, the furnace superimposes everything by far and thus represents the highest optimization potential”. To reduce CO2 emissions, it is therefore necessary to increase the fraction of surrogate fuels from biogenic sources and decrease the amount of fuel from fossil resources. These surrogate fuels from regenerative sources or from recycling material can vary and involve lower CO2 emissions; depending on local and temporal availability. LafargeHolcim uses, for example, recycled matter from wind power plants, roofing felt, or meat and bone meal. Umberto also enables calculating the reduction potential in both CO2 emissions and costs by replacing fossil fuels by secondary or renewable fuels. To further reduce CO2 emissions, LafargeHolcim developed new cement clinkers, which contain, for example, higher amounts of ground granulated blast-furnace slag, a by-product of pig-iron production. These newly developed cement clinkers provide similar features to conventional cement clinker but can reduce CO2 emissions during production by up to 70%! Nevertheless, the process-based CO2 emissions will remain an unsolved challenge, since they cannot be fully reduced. Cement production sites provide ideal conditions for the application of future technologies for the capture and storage of carbon dioxide. 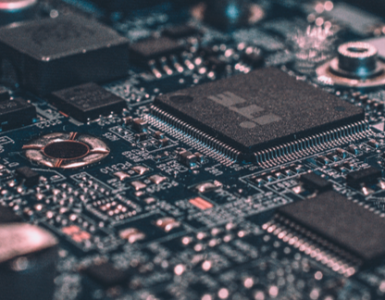 However, these technologies are currently still up in the air! The full presentation and the video recording of the Resource Efficiency Meeting can be found at https://www.ifu.com/events/ressourceneffizienz-treff/ (sorry, in German only).